Joplin High School students walk Tuesday morning, Jan. 10, 2012, under a series of new wall murals by Carthage artist Sherry Pettey depicting Joplin High School before and after the May 22, 2011, tornado. The murals, currently hanging in the Memorial School 9th- and 10th-grade campus, were first shown to the public during a 10 a.m. ceremony attended by the artist. 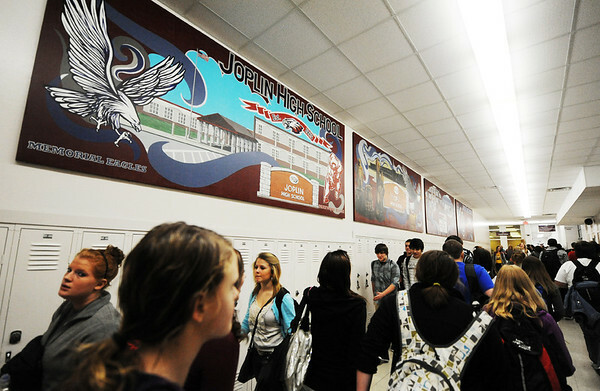 After completion of a new Joplin High School, the murals will be moved there.